At the recent national launch of the An Post Tour of Sligo, taking place over the May Bank Holiday weekend, were left to right: Deirdre Lavin of Sligo Sport and Recreation Partnership; Martin O Hara of Eire Og Cycling Club; Tandem cyclists and Paralympic medal winners London 2012, Catherine Walsh and Fran Meehan; John Delorey of Innisfree Wheelers Cycling Club; comedian PJ Gallagher; and GAA star Sean Og O hAilpin. This year’s An Post Cycle Series, supported by An Post and the Irish Sports Council, has been launched in Dublin, encouraging communities throughout Ireland to get on their bikes. The series has been running since 2009 and more than 40,000 people have taken part to date. Last year more than 100 visiting cyclists from County Galway took part, and once again cyclists of all levels of experience are invited to get training for an event of their choice. With routes catering for everyone from the serious amateur to the enthusiastic beginner, the Series is a great way for family, friends, work colleagues and serious riders to spend a day of fun together on the bike. The An Post Series has one event around the country each month between May and September in the counties of Sligo, Clare, Meath, Waterford and Cork. The Series gets under way with the An Post Tour of Sligo on the May Bank Holiday weekend, with a 10km Hazelwood spin for all and family fun day on Saturday May 4. This is followed by the 60km Lough Gill Circuit, 100km Innisfree Tour, or 160km Ox Mountain Challenge on Sunday May 5. The An Post Tour of Sligo is undoubtedly one of the most scenic cycling events, taking in the iconic mountains of Ben Bulben and Knocknarea, the rugged Atlantic coastline, and the Lake Isle of Innisfree. While the views may be pleasing on the eye there is also some serious cycling to be done with cyclists on both the 100km and 160km events cycling through the Ox Mountains and in the process negotiating the challenging Ladies Brae climb. All events start from the Knocknarea Arena, Institute of Technology, Sligo, and cyclists en route are guaranteed good signage, friendly marshalling, mechanical back up and quality food and water stops. 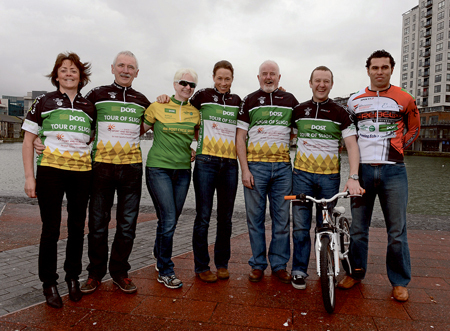 Check out www.tourofsligo.ie The numbers are capped at 2,000.